If you do not see the diameter or length or rope you need, please call us at 501-663-8733 and we will gladly get it for you. Which climbing line is best for you? Samson's ARBORMASTER ropes are a premium 16-strand braided polyester construction with a stabilized nylon core. A smooth, durable surface makes it the best rope for footlock techniques, low stretch (2.5% at 10% break strength), highest-strength climbing line, non-milking, 8, 100 lbs. breaking strength. Comes in three color combinations. New England's SAFETY-BLUE and HIVEE climbing ropes are 16 strand with a blue safety core to alert users to wear. The plied strand yarns are best for abrasion and snag resistance. The protective coating enhances durability and grip. Is non-milking, 7,000 lbs. breaking strength. Samson's ARBORPLEX is value priced, low stretch (3% at 10% of breaking strength), 12 strand single braid construction of plied polyester and polyolefin fibers that resists snagging. Rope is relatively light, works well in wet conditions, non-milking, 6,000 lbs breaking strength. No twist stripe. 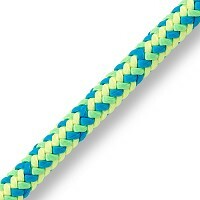 Samson's TRUE BLUE is a very flexible, low-stretch, 12-strand single braid 100% polyester construction. Each strand consists of blue fiber over white fiber to assist the climber of cover wear. A soft rope but heavier than most climbing lines. Non-milking, 7,300 lbs breaking strength. Can also be used for light/medium duty rigging. Samson's VELOCITY ropes are the lightest weight climbing line on the market. It is for those who prefer that “broken-in” feeling and “sure grip” technology. Excellent knot holding ability and works well with hardware. Coated for abrasion resistance, 24 strand, 6,000 lbs. breaking strength. Does milk. New England's TACHYON ropes are lighter-weight than most tradition climbing lines. 24-strand, double braid, non-milking, 6,800 breaking strength. Great rope for commercially available mechanical devices. Popular in rope rescue and mountaineering. Petzl's VECTOR line is NFPA rated, low stretch, knotability and shape retention. It is designed for difficult to access environments and for fall protection. Ideal for vertical life lines, tower climbing, rescue and tactical operations. 7,000 lbs. breaking strength. New England's SAFETY-PRO is a 12-strand climbing rope with each strand braided around a blue nylon-core. The high twist levels increase abrasion resistance and lengthens service life. It strikes the perfect balance between firm and supple. Comes with orange and green tracers, 7,500 lbs. breaking strength. New England's KM-111 is the industry standard for static rope in rescue and rappelling operations. It is the only dual-certified static on the market. It has a 32-carrier polyester cover over a nylon core which absorbs less water, lower stretch, and more abrasion resistant than other commercially available static lines. Ascenders grab onto the polyester cover and the climber is able to move up the rope without the bounce associated with all-nylon climbing rope. Depending upon diameter of rope, 4,500 to 11,000 lbs. breaking strength.